Glaucoma: What is it and how is it detected? Laser iridotomy is a surgical procedure used to treat angle closure glaucoma and those at risk for angle closure glaucoma. As with many medical conditions, it is preferable to treat patients at risk and thereby avoid vision loss. Like other forms of glaucoma, angle-closure glaucoma has to do with pressure inside the eye. 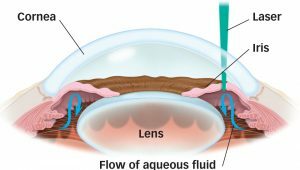 A normal eye constantly produces a certain amount of clear liquid called aqueous , which circulates inside the front portion of the eye. An equal amount of this fluid flows out of the eye through a very tiny drainage system called the drainage angle, thus maintaining a constant level of pressure within the eye. There are two main types of glaucoma. The most common type is open-angle glaucoma, in which fluid drains too slowly from the eye and causes a chronic rise in eye pressure. In contrast, angle-closure glaucoma causes a more sudden rise in eye pressure. In angle-closure glaucoma, the drainage angle may become partially or completely blocked when the iris (the colored part of the eye) is pushed over this area. The iris may completely block the aqueous fluid from leaving the eye, much like a stopper in a sink. In this situation, the pressure inside the eye can rise very quickly and cause an acute angle-closure glaucoma attack. Symptoms of an acute angle-closure glaucoma attack include severe ocular pain and redness, decreased vision, colored halos, headache, nausea and vomiting. Because raised eye pressure can rapidly damage the optic nerve and lead to vision loss, an angle-closure glaucoma attack must be treated immediately. Unfortunately, individuals at risk of developing angle closure glaucoma often have few or no symptoms prior to the attack. Risk factors for angle-closure glaucoma include increasing age, farsightedness (hyperopia), and Asian heritage. Some early symptoms in people at risk for angle-closure glaucoma include blurred vision, halos in their vision, headache, mild eye pain or redness. People who are at risk for developing angle-closure glaucoma should have a laser iridotomy. Many common medications, including over-the-counter cold medications and sleeping pills (and any other medication that can dilate the pupil), should be avoided until after the laser procedure is completed. If one eye has an attack of angle-closure glaucoma, the other eye is also at risk and may need treatment. What happens during laser iridotomy? Using a laser, a small hole is made in the iris to create a new pathway for the aqueous fluid to drain from your eye. The new drainage hole allows the iris to fall back into its normal position, restoring the balance between fluid entering and leaving your eye and lowering the eye pressure. The surgery is performed by your ophthalmologist (Eye M.D.) on an outpatient basis, usually in his or her office. Your eye will be numbed with eyedrops. After the laser treatment, aqueous fluid flows through the new iridotomy, reducing the risk of acute closed angle glaucoma. A contact lens is placed on your eye to serve as a precise guide for the laser. A hole about the size of a pinhead is made in your iris, and will be concealed from view by your upper eyelid. The actual procedure will only take a few minutes. You should plan to have someone drive you home afterward. The risks and side effects of glaucoma treatment are always balanced with the greater risk of leaving glaucoma untreated.